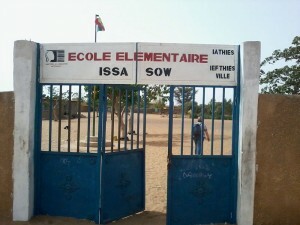 Founded in 1985, ISSA SOW high school is found in the Keur Issa neighborhood on the far east side of Thies. 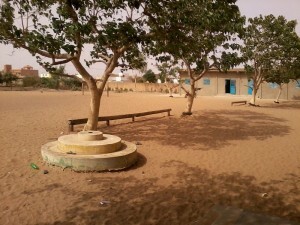 Today the school has 12 classrooms and an office for the director, a multimedia room, a nurse’s office, an area dedicated to sports, and a vegetable garden. This 3,000 m2 garden houses a functioning well that uses an electric pump to fill three basins which can hold five cubic meters of water. 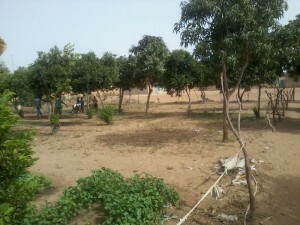 Thanks to the work of the students, under the supervision of the teachers Cheikh Tidiane Sow, Ansoumana Kanté, and Mawa Ndiaye several products are cultivated and harvested in the garden: lettuce, mint, spices, beans, and some fruit trees. This activity is only possible thanks to the constant support of our partners from GIPS/WAR (Initiative group for Social Progress), an advisory and support committee for initiatives relating to economic, social, and cultural development of rural and urban women. The school currently houses 840 students (429 girls and 411 girls) divided into 12 classes which are taught by 17 teachers and overseen by the director. Almost all of the students come from poor families and thus some of the products are used in the school’s cafeteria to help respond in part to the nutritional needs of the students. In addition to the garden’s use for producing food, it also acts as an important teaching tool. 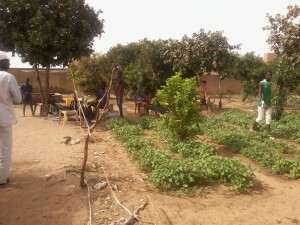 In fact, the students are taught basic farming techniques in the garden. This gives them practical knowledge that they can then use to help their families in a real way. Despite a diversified industrial base, agriculture and fishing are the dominant sectors in Senegal’s national economy and employ 50% of the active population. Agriculture, in particular, underwent profound transformations during the colonial period, with the gradual replacement of subsistence crops with monocultures destined primarily for export, like peanuts. This led to changes in the food habits of the Senegalese. 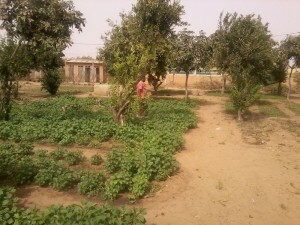 For example, in urban areas rice is now eaten every day instead of millet and fonio; though hardy, better suited to the local environment and incredibly nutritious, these grains are now considered “poor.” The Slow Food network has been developing here since 2004, working on food education in schools and creating educational food gardens. The mapping of local foods and dishes led to the creation of the Fadiouth Island Salted Millet Couscous Presidium. Members of Italy’s Senegalese diaspora are now also getting involved in setting up sustainable agricultural activities in their home country.